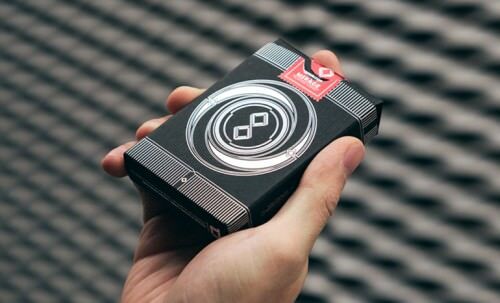 The Mirage V3 Eclipse Edition Deck is the third edition of the Mirage Playing Cards that have been released by magician Patrick Kun. The very first version of the Mirage deck appeared back in 2013, and since then it's seen a couple of colours and styles, courtesy of a Dawn and a Dusk edition. Well designed and ideal for both magicians and cardists alike, this deck centers around swirling designs and flowing patterns. 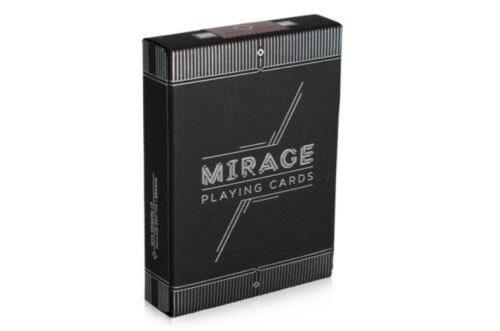 But now for the first time the Mirage deck is making a debut in stunning black and silver colours. This new Eclipse Edition also features an outstanding new card-stock with a finish that is a first from experienced publisher Legends Playing Card Company. And for the magician, it even comes with a hidden secret! Patrick Kun is a gifted close-up magician that has the distinguished honour of being a consultant to high profile magicians like David Copperfield and Cyril. He's also made numerous TV appearances himself. He's also been the star of several commercials involving magic, as you can see here. 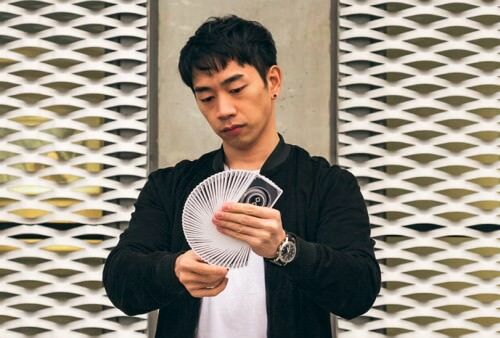 After spending his early years in his homeland of Thailand, he moved to the USA in order to work for Copperfield in Las Vegas, which itself speaks volumes about his talent. But besides his success as a performer, of special interest to us are his achievements as a creator of magic products and playing cards. Besides his VISA Playing Cards, Patrick Kun's Mirage decks are now into their third incarnation, and the Version 3 Eclipse Edition is arguably the best yet. The tuck box of this attractive deck makes an immediately striking impression with its classy look. Made from a thick and sturdy black cardboard, this is built to last, with a very durable card stock. Immaculate silver foil has been stamped into the tuck case, which stands out from the black to create a cool and sophisticated look. 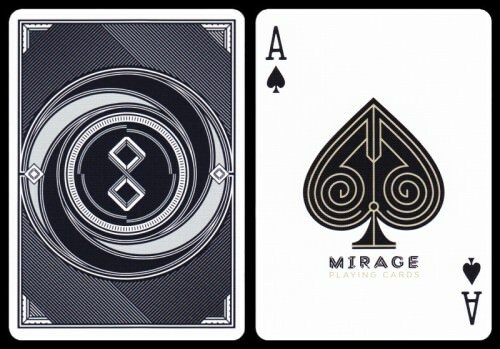 Around both the top and bottom is a rich border of silver foil lines, while the front of the box showcases the deck's name: “Mirage Playing Cards”. Meanwhile the back of the tuck case features the almost hypnotic circular shape that will soon become familiar to us from the back of the cards, complete with two squares forming a figure eight style shape. All of this comes together in a package accented with silver foil, for a truly amazing look. In the midst of all this stylish black and silver, the red metallic stamp stands out all the more, the result being a truly stunning tuck-case that you will be pleased to bring out on show. The back design of these cards has been deliberately designed to be the ideal servant for both magicians and cardists alike. A black and silver colourway prevents the card backs from having too much colour, and also from being too distracting. With nice white triangles in the corners of the cards and borders, and a bold circular centre that creates a hypnotic shape during movements, these cards look superb when being put through their paces with card flourishes. Black, white and silver always looks great together, and this combination of colours will be at home in practically any setting. 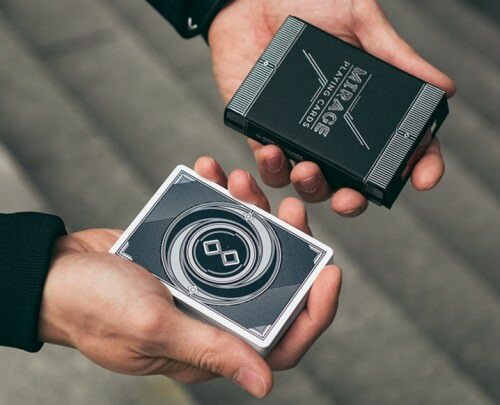 Cardists who insist on matching their outfits to their decks will be pleased to know that this deck is the ideal clothing accessory, and it will complement your look no matter what you wear! The faces of the cards are mostly standard, making them perfect to use for a range of magic effects. 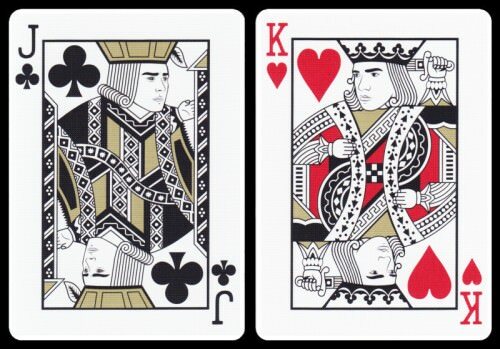 Under the direction of artist Tomas Hlavaty, some modifications have been made to the faces of the court cards for a custom look that is stylized without appearing too out-of-the-ordinary. These employ a slightly modified colour scheme, in which the usual garish yellow has been replaced with more muted colours, to create a more sophisticated look. The Ace of Spades is a large spade with intricate lines through it, and also features the name of the deck beneath it. 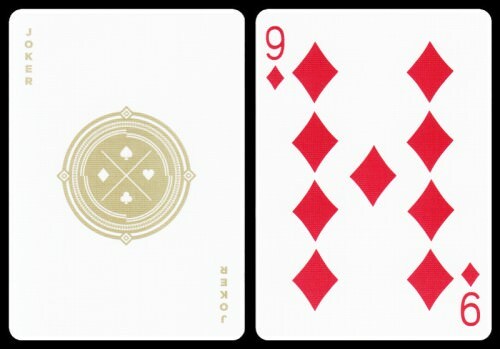 The number cards are fairly standard, and two identical custom Jokers round out the deck, with their matching qualities that can prove useful for magicians as well. While the visual aesthetics of the back design are stunning in themselves, they also hold a special secret. Each card is individually marked, allowing you to be able to quickly discern the identity of a card just by looking at the back. For obvious reasons, this is a welcome gift for the magicians, and can prove very useful for a range of magic tricks. Courtesy of the generous creators, the tuck box provides a secret link that will bring you to a page online that teaches you both the marking system and a magic routine that can be performed with it. The marking system is very well hidden, and it is a pleasant surprise to discover that it can even pass the riffle test quite easily. Despite this, it reamins quite readable, and if you put the practice in you will be able to read it quickly. It is quite simple, and while it requires a bit of quick thinking, it's not a complex system. The fact that the markings are on all four corners means that it can even be conveniently read in a spread during the process of selecting a card. 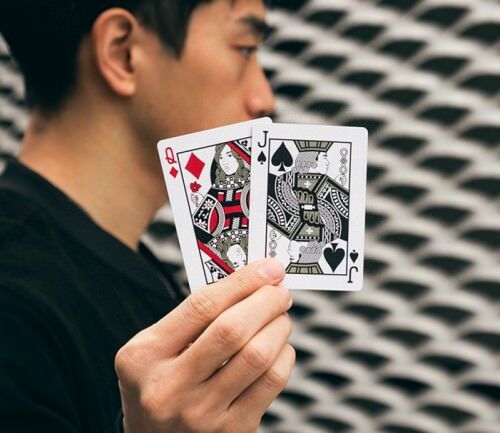 These cards have been printed in Taiwan by Legends Playing Card Company (LPCC) on their brand new “Cardistry Stock”. This stock is very soft straight out of the box, and quite different from the rest of Legends decks, which are extremely durable, but tend to be somewhat stiff with a significant snap. The Mirage V3 cards handle great out of the box, and have a soft feel that requires no breaking in period whatsoever. This pleasant and papery card stock is complemented with an embossed finish and coating that ensures smooth spreading and fanning. The cards have been traditionally cut, which is perfect for face down faro shuffles. And as we've come to expect from LPCC playing cards, the registration and printing is perfect, meaning that the borders are consistent in size - exactly the way you want it. As an extra gift for magicians, the cards come pre-arranged in Juan Tamariz’s Mnemonica stack, meaning that this deck can be brought new-and-sealed straight into a performance. Once again Legends Playing Card Company is proving their growing credentials as an industry leader in the custom playing card business, by partnering with a reputable creator like Patrick Kun, to produce a delightful deck of playing cards that is quality all round. 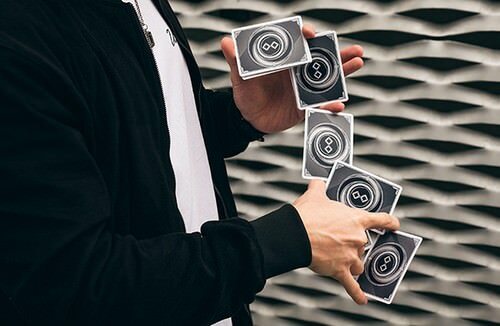 Their new Cardistry Stock finish didn't in the least disappoint, and I for one am hoping we'll see more decks with a similar stock and finish, due to its delightful handling. This deck is a beautiful design both inside and out, and its style offers a flexibility that ensures that it will be at home in almost any environment. Magicians will especially warm to its hidden secrets, while cardists will delight in the curves and colours of its sharp graphic design. The hidden secrets that await discovery make it somewhat less than ideal for card games, but among the unenlightened, this deck can find a welcome home at the game table as well. Whether your love is card games, card magic, card flourishing, or just plain card collecting, almost everyone is going to find something to love about Patrick Kun's Mirage V3!